Only two months to the day until our wedding! Last month I had my second dress fitting. The seamstress had starting working on the additions we discussed at the first dress fitting and had taken the dress in the appropriate number of inches (as measured in January). The additions were pinned on (nothing permanent yet) but they absolutely elevated the dress to a completely different level. I couldn’t believe how she had taken my, expertly articulated (yea right) description of what I wanted and translated it so perfectly into existence. The dress is truly one of a kind now. My prancing a twirling had to be kept to a minimum due to the hundreds of tiny blood thirsty pins protruding menacingly from the dress, BUT I managed to celebrate my excitement over the dress’s beautiful transformation standing still and bobbing happily in place (I’m sure I didn’t look ridiculous at all). The dress has to be taken in again (female readers will share in my absolute joy over this development) way to go half-marathon training, so my third and last fitting is scheduled for a week before the wedding. That’s only SEVEN days before actual big day. That makes me entirely and absolutely nervous but it’s the best and only way to ensure a perfect fit on the day of. I WISH that I had pictures to share of the fitting but, alas, that would ruin the wedding day surprise. So instead I’ll leave you with this, an expertly cropped, ridiculously tilted picture of my dressing room door. You’re welcome. Last weekend I had my first wedding dress fitting. Earlier, on the day of the fitting, my mother and I went to the mall to try to find some appropriate undergarments that would be unnoticeable under my dress. When we arrived at the undergarment store I had to fill out a survey, one of the questions was “do you believe that a bra can change your life?” It was at this moment that I feared this would be some kind of holistic bra experience. I was, to my dismay, absolutely correct. The store ACTUALLY uses a holistic approach to bra fitting meaning no tape measures, fitting guides, or common sense. They literally want their bras to change your life. I played along and quickly found something that would work for my fitting a couple of hours later. Luckily, I didn’t have pray to the bra gods or sacrifice a sock or worse, my current bra beliefs to get the bra. Surprisingly they accepted all major credit cards. Regardless of how odd the experience was, I found a bra. The trip was a very strange great success. NO MORE HINTS, you’ll have to guess from here on out. We got to the boutique and I changed into my dress, complete with holistic spiritual bra, slipped on my first pair of shoes and stepped out to be altered. 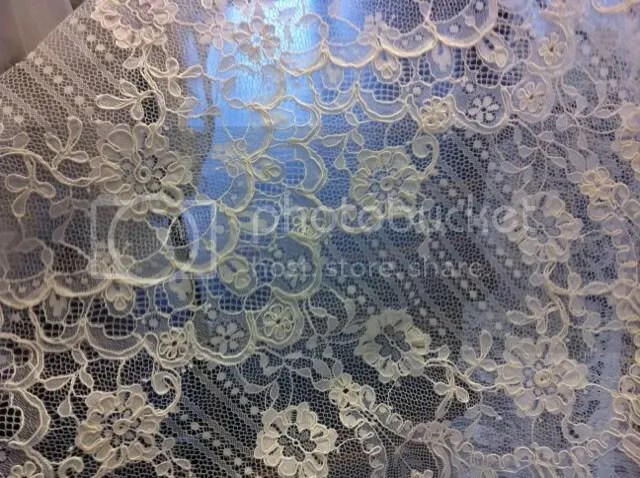 We requested a particular seamstress that the boutique uses based on her expertise with the material shown above. She wasted no time in pinning the billions of fabric layers up about a foot (I’m short OK) so that I wouldn’t trip on them on the big day. I nervously told her all about my fear of falling down the set of stairs on my way to the aisle and she assured me that the alterations would allow me to walk, dance, sit, stand, and be married with no major tripping issues (fingers crossed). She explained to me how each layer of fabric would be altered to a certain length so that as I walk each layer will push the one on top of it out of the way. She was literally a blur as she scooted around the perimeter of my dress expertly pinning fabric away from the floor. We agreed on how much to take the top of the dress in and discussed the more complicated additions and alterations. 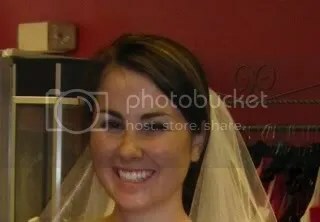 And after hearing about my veil aversion, she even agreed to custom make a veil so that it will be EXACTLY the way that I want it. We managed to get in and out of the boutique in under an hour and I left with a renewed sense of love for my perfect dress. Seeing it pinned to the right length gave me my first real glimpse of what the final product will look like. AND I made an appointment for my second fitting on March 17th. MY DRESS HAS ARRIVED. The last time that I was at the bridal boutique they informed me that my dress would arrive in late March or early April. I was extremely surprised by a phone call last week telling me that MY DRESS HAD ARRIVED! I made an appointment for the next evening to go and try it on to make sure that 1) it was the right dress, 2) it somewhat fit, and 3) it was the right color. Check, check, and check. I didn’t think that there would be any difference putting MY dress on versus the sample dress in the store. I was wrong. My dress was perfectly pressed and lovely and perfect, it was way more fun to put on. After I twirled around a bit (ok, A LOT) I took it off and shoved it gingerly back into its dress home/bag. The consultant asked me when I would like to make my first alterations appointment. (I am adding some “extras” to the dress so alterations have to start ASAP). I made an appointment for late January and was ready to get out the door. This is where things got interesting. She grabbed the dress bag handed it to me and said “don’t forget to bring your wedding day shoes to the fitting”. First of all, it hadn’t even crossed my mind that I would be TAKING MY DRESS HOME. And secondly SHOES?!!! I hadn’t given my shoes a second of consideration before this moment. 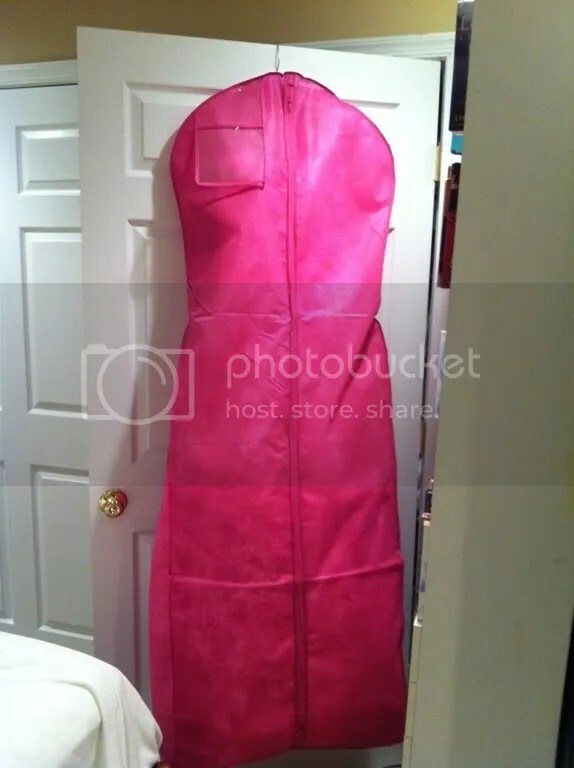 Looking back it all makes sense, bridal boutiques don’t have the room (or the patience) to store and/or battle those massive dress bags for the countless brides they order dresses for. 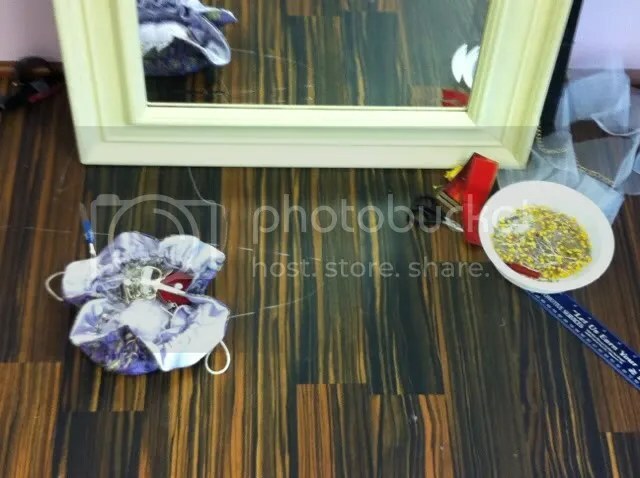 And of course I needed to bring my shoes to the fitting, at 5″3′ they could probably make an extra bonus dress out of the material they will have to take off of the bottom of the dress so that I’m not tripping my way down the aisle. My mother and I ever so gently carried the dress out to the car and then had to carefully consider the pros and cons of putting it in the backseat vs. the trunk. We somehow managed to get it home and now it is hanging, at my mother’s house just waiting to be worn. 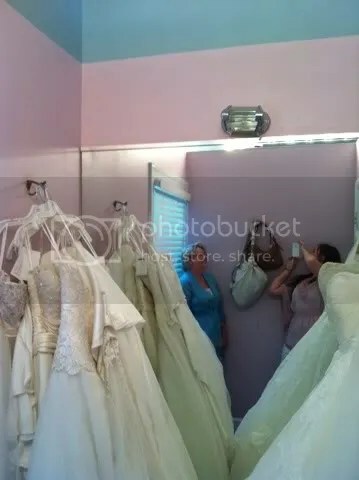 As I emerged from the fitting room I found out that my consultant hadn’t yet learned how to clip the dresses back so as I tried them on they all looked 4 sizes too big and I had to result to pulling them tight behind my back with one hand while looking in the mirror and trying to re-imagine myself with two arms on my wedding day in the dress (talk about mentally exhausting). Needless to say, it wasn’t a magical experience. My mom and I got through about half of the dresses before we called it quits. Despite the less than stellar experience, I did find a dress that piqued my interest. Fortunately, it was by the same designer as the dream dress from the first shopping day. Literally as soon as we stepped foot out of the salon my mom and I were on the phone with the boutique that had my original favorite dress making an appointment for this week to try both dresses on back to back so that I could see both dresses clipped back to my size with both arms in view. As the week crept by I kept thinking about both dresses, going back and forth in my head about how each of them looked on me. By Friday morning I had convinced myself that I would never ever ever decide on a perfect dress and that I was absolutely positively doomed. Somehow, I managed to make it through the week despite my crippling dress doubt. As my mom and I arrived at the bridal salon on Friday evening, my absolute favorite bridal consultant out of all of my appointments lived up to her status by having both dresses ready for me to try on in the dressing room. First, she helped me get into the new dress that I had discovered on Sunday in Alexandria. As I stepped out in front of the mirrors I looked at the dress, I loved it. At this point I was still conflicted and the cloud of wedding dress doom lingered near by. It was time to try on the original dream dress….As I shimmied my way into the layers of fabric and was strapped, buttoned, zipped and clipped in, I could just feel the rightness of this dress. As I stepped out in front of the mirrors my initial love with the dress was absolutely multiplied by the time that I had spent away from it looking for other dresses. This was without a doubt THE ONE. This was the dress that made my mother cry as she saw me walk out of the dressing room, this was the dress that I felt absolutely stunning in, this was the dress. I am infinitely glad that I took the time to walk away from the dress the first day that I started looking. The time that I spent looking at other dresses and continuing the shopping experience only made my decision easier when I tried the dress on again. The second time I put it on, I had removed all doubt from my mind about whether or not this dress was my dress, it simply was. As I mentioned in my last blog post, the adventure of dress shopping began last weekend. I had three appointments set up throughout the day (10:00AM, 12:00PM, and 2:00PM). We started our day at 9:30 when my mother and I picked up my maid of honor and one of my bridesmaids who both graciously dedicated an entire Saturday to the cause. I wanted to try on a few dresses that I had seen online and the first store claimed to have three of them available. As we walked in, the very first moments of my very first wedding dress appointment were marred by a quick and venomous snap from the saleswomen working behind the counter asking if we had made an appointment. As we explained that we did indeed have an appointment, she held a quick standing evaluation of what I was looking for, she barely glanced at the pictures I had gathered representing the dress features that I found most appealing. After explaining the silhouette, neckline, and material that I was interested in and mentioning the three dress style numbers that they said they had, she was quick to dash my hopes of trying on anything remotely close to what I was looking for. The shop was small and had ONE dress that even came close to what I was looking for (except for the fact that it had super sized, tacky flowers made of tulle all over it). Not to be deterred by what I was looking for, the saleswomen brought in 10 or so dresses for me to shimmy in to. I’ll save you the agony of suspense by telling you that none of these dresses turned out to be my dream dress, shocking I know. One advantage to this store was that in trying on dresses that were different from the style that I thought I would like, I found out that I could broaden my search to include other silhouettes that I hadn’t seriously considered. A downside to wanting to try on a wider variety of dress styles is that you have to try on two or three times as many dresses at each store. It also makes things confusing when you find two dresses that you love that are two very different styles (“but I like them both for different reasons!! !”) I’ll get to that dress love triangle later in the post. Needless to say we left the first store empty handed and feeling a little dejected. Luckily, I had two more appointments scheduled providing me with ample time (and dresses) to aid in my search. As we walked into the second store we were immediately impressed (and terrified) at the number of dresses they had to offer. There were literally dresses hanging from every inch of this store. I’m talking racks and racks of wedding dresses, dresses hanging from the walls, dresses in back rooms, it was both overwhelming and extremely exciting. Just walking in to this second store re-energized the entire day. A wonderfully kind and helpful saleswomen looked through my magazine cutouts and computer printouts to get a better idea of what I was looking for. She then unleashed us on the dresses, pointing us in the general direction of some that I might like. They, unlike the first store, actually had one of the dresses that I wanted to try on! I pulled 10 or so dresses and loved the first one I tried on. I tried on another one and like it A LOT. I tried on one of my dream dresses and LOVED it. I had a serious problem. I loved two dresses and really really like a third one. The two that I loved were VERY different styles which just made my tangled dress love affair more complicated. I loved the shape, detail, and material of both, even though they were almost exact opposites of one another. I made up my mind to eliminate the third dress because although it was beautiful it didn’t really contend with the other two. 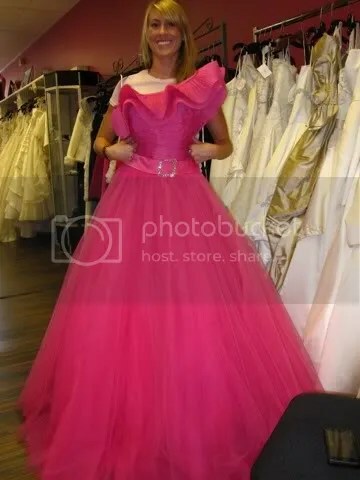 We all had to stop qualifying each dress I tried on as “so beautiful” because lets face it, with the exception of the super tacky tulle flower covered dresses, they were all beautiful. After trying on all 10 dresses, I had two solid competitors. A nice thing about this store was that we were allowed to take pictures of the dresses as I was trying them on. They also wrote down the designer and style number of the dresses that I liked. I left the store excited, confused, and torn between the two dresses. Even with pictures of me in the dresses and style numbers in hand I had no idea how I was ever going to decide between the two. I have finally decided that it is time to get serious about dress shopping (and by serious I really mean, get started). With 311 days until the wedding (theknot.com tells me every time I log in I’m not counting down every day…I promise) I’m trying to give myself plenty of time to be as finicky and indecisive in choosing a dress as I wish to be. I used to think that finding a wedding dress simply entailed going to a dress shop and trying on dresses. This idea was quickly replaced by that little part of my brain that slowly steers me towards a path of meticulous planning. For some reason it seems to take over whenever I decide to cross things off of the wedding to-do list. As I began to browse gowns on websites I quickly learned that by visiting a designer’s website and plugging in your zip code you are immediately presented with all of the dress shops that have your desired dress within a 50 mile radius (awesome). So I did what any logical human being would do, I made an excel spreadsheet cross referencing designers, boutiques, prices, etc. for each dress. Nothing says weddings and romance like a spreadsheet (…no?…just me?). Dress shopping is slated to begin this weekend and I will most definitely keep you all updated on any progress, frustrations, successes, and/or failures as the shopping begins.